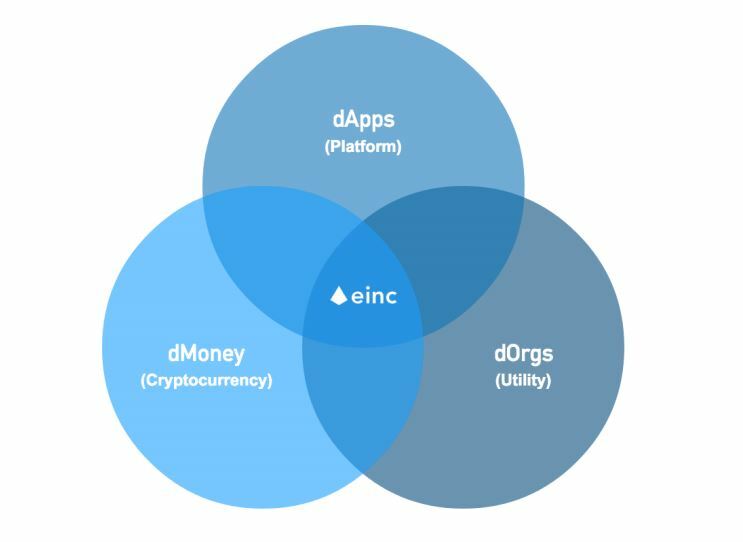 The intent of EtherInc is to create an alternative protocol for running decentralized organizations and building decentralized applications, providing a different set of trade-offs that we believe will be very useful for a large class of decentralized applications, with particular emphasis on situations where rapid development time, security for small and rarely used applications, and the ability of different applications to very efficiently interact, are important. EtherInc does this by building what is essentially the ultimate abstract foundational layer: a Blockchain with a built-in Turing-complete programming language​, allowing anyone to write smart contracts and decentralized applications where they can create their own arbitrary rules for ownership, transaction formats, and state transition functions. A bare-bones version of Namecoin can be developed by writing two lines of code, and other protocols like currencies and reputation systems can be built in under twenty. Smart contracts, cryptographic “boxes” that contain value and unlock only if certain conditions are met, can also be built on top of the platform, with more power than that offered by Bitcoin scripting because of the added powers of Turing-completeness, value-awareness, Blockchain-awareness, and state. EtherInc (also referred to as eInc in short) is making DAOs a reality. eInc organizations are borderless and decentralized, just like Bitcoin, that are not limited by geographies, intermediaries and, other such artificial restrictions. The concept of distributed teams collaborating from all over the world, has gained momentum over the past few years. Working as distributed teams opens up new possibilities and avenues. The existing organizational system work reasonably when all the parties are a part of and governed by a common organizational framework which is regulated by regulatory bodies of one jurisdiction, and are located in one jurisdiction. However, this is not the direction where the future of organizations is headed. Traditional businesses are being replaced by resilient startup organizations where teams are no longer shackled by geographies and jurisdictions. According to a report published by Global Entrepreneurship Monitor, there are more than 300 million entrepreneurs launching 150 million startups globally, each year. While this number may seem impressive, only a third of these startups i.e. 50 million actually materialize, and hence benefit society in one or more ways. Inspecting the reasons behind the failures of these new organizations, insufficient capital stands out as the most prominent factor. Organizations which fail, usually do not have the capital investment to sustain themselves for even six months, let alone the idea of turning into successful ventures. Different country specific compliances and regulations create friction Ever changing compliances and regulations which must be adhered to if you wish to avoid penalties which can scale up to as much as $50,000 in establishing your organization. These regulations tend to cause major friction for startups and deter brilliant minds from all across the globe from collaborating. For example, if you are from Australia and your friend, let’s say, from Ukraine, wish to collaborate and start a company together, then there are multiple documentations and country specific regulations (of both Ukraine and Australia) which you must adhere to achieve compliance with both jurisdictions. You will also be required to hire legal practitioners who will charge a hefty fee for the documentation of contracts, payroll etc., apart from bank charges, transfer fee etc., which you will encounter during the running time of your organization. Heavy incorporation costs, prohibitive legal fees, high transaction charges, etc. Incorporating an organization involves a lot of paperwork as well as legal back and forth which are a burden on startups, which haven’t even started generating revenue to break-even, let alone making profits. For example, in incorporating a company in the U.S . there are the incorporation costs, EIN 1 number costs, state taxes, tax filing charges, insurance etc. which has been estimated to cost a startup upwards of $7500+. And this is just the cost encountered by organizations who have citizens of the U.S., as founders. If you have founders from places other than the U.S., then the costs can even rise further. More costs are encountered in establishing a financial management system with a financial consultant or a CFO heading all these operations. You will also be required to hire a Chartered Accountant for managing your ledger, calculating profits, reducing costs, and disbursing funds, when and where required. A company in its initial stages, encounters a lot of disagreements and conflicts among its founders, as there are times when their opinions and thought-processes do not match. While the differences in ‘vision’ might get resolved before company incorporation, there are other issues which arise as friction between founders with respect to resource utilization or how to proceed further. Such situations demand a system of conflict resolution which ensures that a company’s future is not put in jeopardy, simply because a decision could not be arrived at. Working in a new startup organization, one is always prone to the risk of disagreements which eventually lead to one of the partners or stakeholders backing out, and hence, leaving the future of the company and other partners/collaborators in jeopardy. Legal documentation and regulation-compliance take years to iron out and bring balance back to organizations, giving stakeholders a chance to find loopholes within the system, which they can exploit for their singular benefit. While there are other ways of securing funds like crowdfunding, ICOs, etc., these methods of raising money have got a bad name due to numerous scams , happening across the globe, leaving the investors at huge risk. In short, startups face trust issues because of the high costs of setting up a multi-national organization, which might not be necessary, or financially feasible during the early stages of the project. 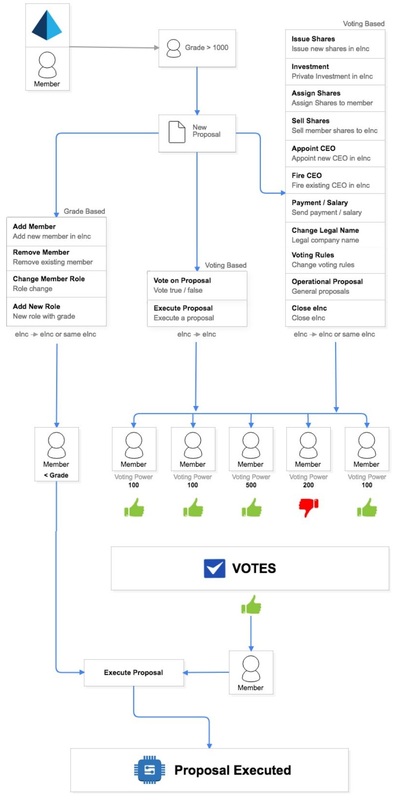 Lack of organizational framework may result in disputes on various grounds like, distribution of profits, reaching consensus through voting, raising capital from external sources, bringing new members to the organization, and transfer of stakes etc. Involving mediation/arbitration in case of disputes are expensive, are an unnecessary nuisance, and are often impractical. To transform the startup sector, which currently has more than 305 million companies registered, and is growing at the rate of 100 million companies globally annually. To prop up/support almost 100 million startups which close down every year due to any of the reasons outlined above; inadequate cash reserves being the second highest reason. To encourage more than 5 million entrepreneurs, who are not funded by VCs and Angel Investors, to take their ideas off the drawing board by helping them raise funds via crowdsale, with confidence. To shape a world where people around the globe can work together​, as a single organization, based on cryptographic proof instead of trust, and operate borderless, permissionless, democratically, and transparently, with the consensus of its shareholders, without the need of a trusted third party and/or costly intermediaries. 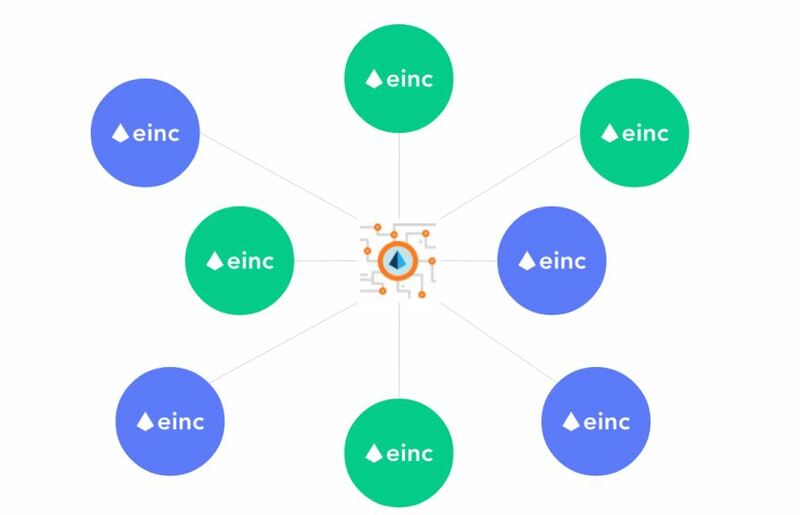 To summarize, eInc empowers teams around the world to create, manage, and operate decentralized democratic organizations that are more resilient and trusted​. This enables efficient creation of value without borders, restrictions, and costly intermediaries or a trusted third party. This is something akin to what Bitcoin achieved in the payment space. eInc Organizations that run with the consensus of its shareholders and operate democratically, will protect the interests of the majority of the shareholders and boost investor confidence.